In my house, EVERYTHING is about being a boy! Going to ball games, fixing cars, monster trucks, digging in the dirt, loud noises, sports, wrestling around, weird smells, climbing, and all over boy silliness is the norm in my house. I’m not saying my boys can’t be the sweetest things when they want to be, but being the only female among these manly men can be difficult at times. That’s when I get my craft on! Yesterday just happened to be one of those days. I had worked a couple of night shifts, and came home to find my house a little messier than usual. I looked at all the toys on the floor, breakfast dishes on the table, pajamas hanging from doorknobs, and turned myself right back around and got back in my car. Sure I was tired, but at that point, only a craft project would do. So off I drove to gather my supplies. A few hours later, this is what I had created. Cost: $5 for flowers. Glass vases/candle holders run between $4-$6 depending on size, but I just used what I had around the house. Directions: Place flowers in vases, placing blooms up (I just popped the blooms off the bouquet I bought, no cutting required). 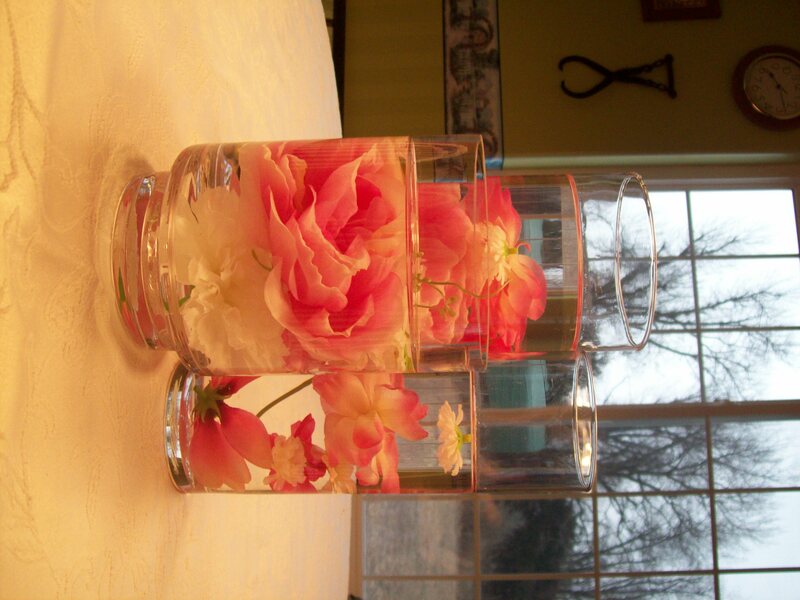 Fill vases with water, leaving space at top. You can then rearrange flowers for appearance. Wipe vase top (inside and out) with cloth to remove any water marks. Voila! You’re done. So simple and easy, I’m sure it will make a wonderful centerpiece for your table! 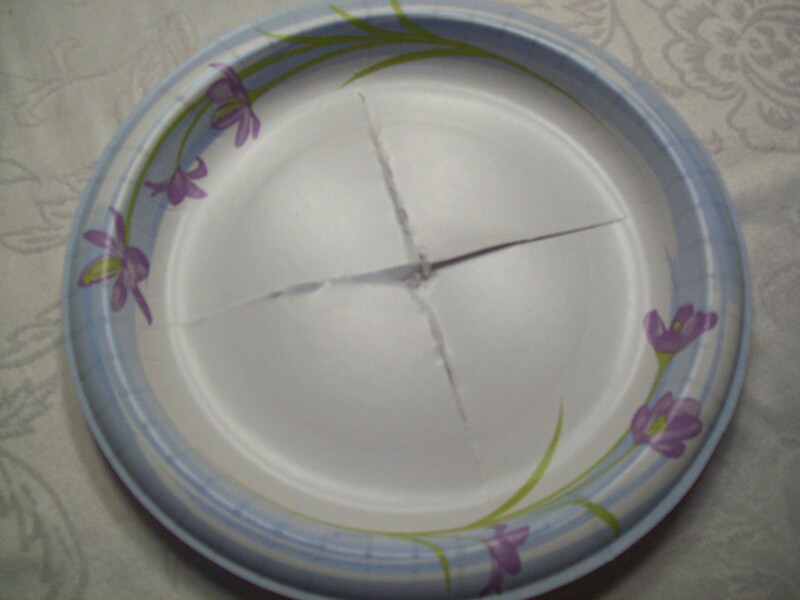 Take a paper plate and puncture a hole in center. Then cut an X in the middle, up to the sides. 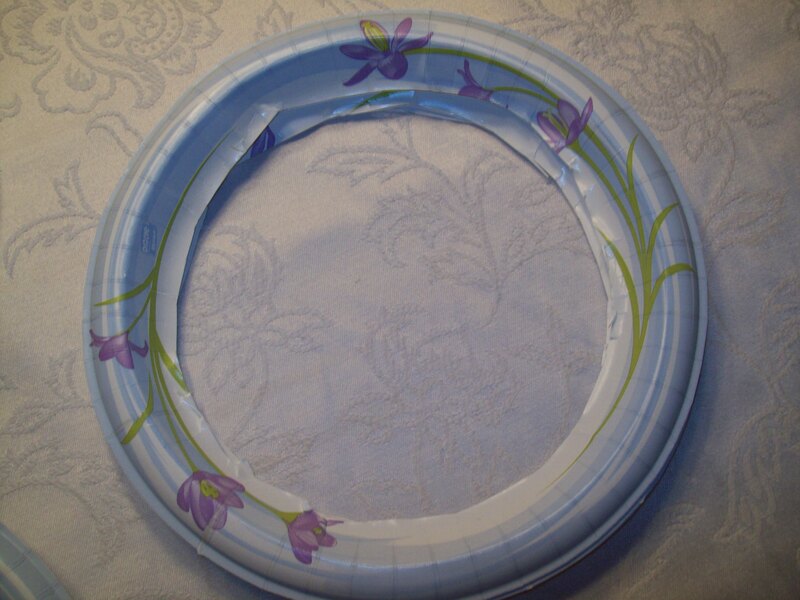 Next, cut around the inside of the plate, so you only have the outer edge as a ring. Repeat this for all 5 plates. 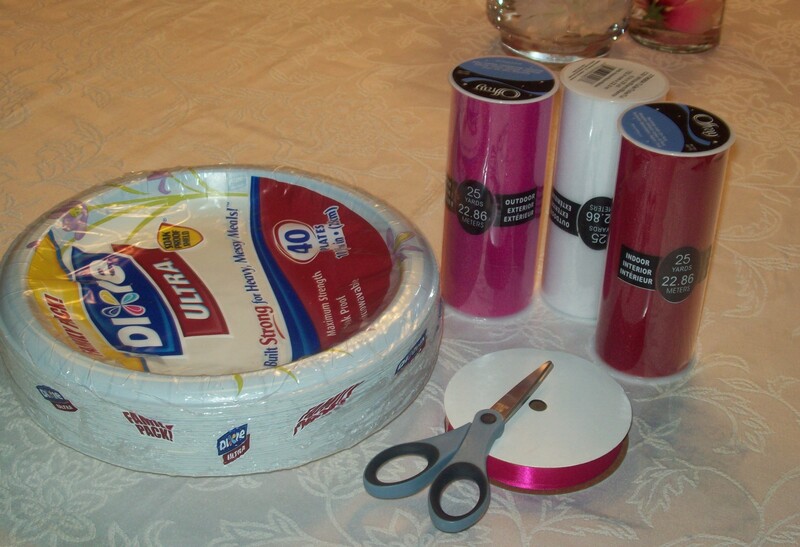 Stack paper plates together. Next, you will add the tulle. I cut each color of tulle in 14in pieces (you can estimate or measure with ruler…whatever you’re most comfortable with), cutting each piece as I went. I found it easier to cut as I went, rather than cutting all the tulle at once. 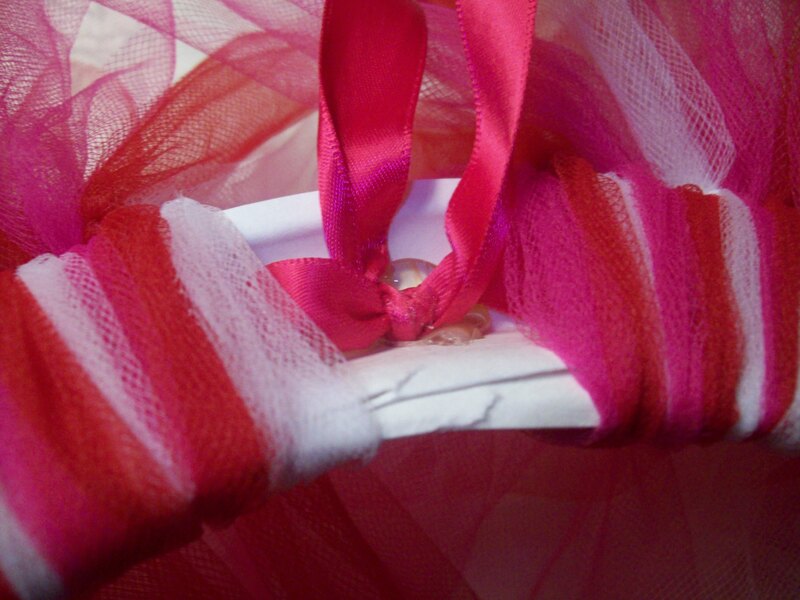 Also, it kept my tulle nice and neat on the spools. To add the tulle to my paper wreath, I just tied a knot, pulling it taut, and then double knotted it. I used at red, white, pink pattern, but you can use whatever pattern is best for you. After you tie a piece, you will want to slide it next to your other pieces. 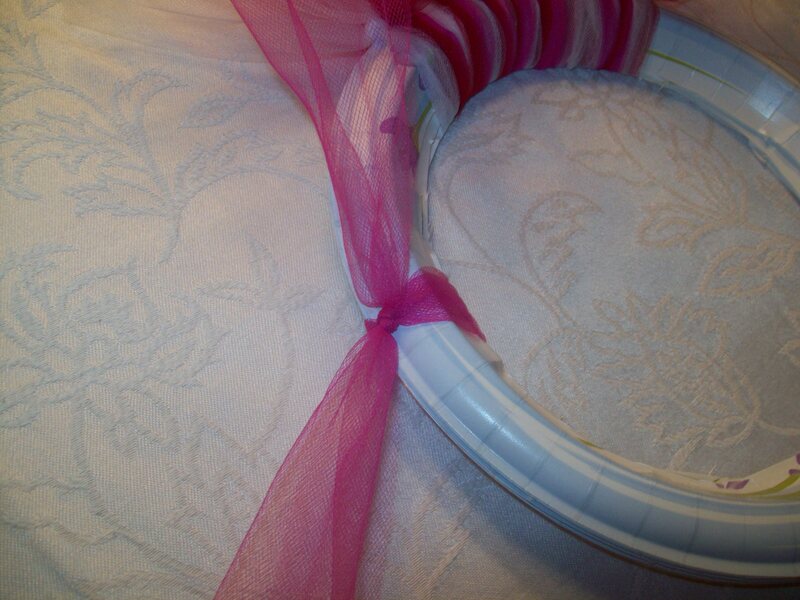 Remember to push your tulle pieces tightly together, so that it covers the entire plate. Also, I made sure the knots were evenly placed (I put mine right at the edge of my plate). 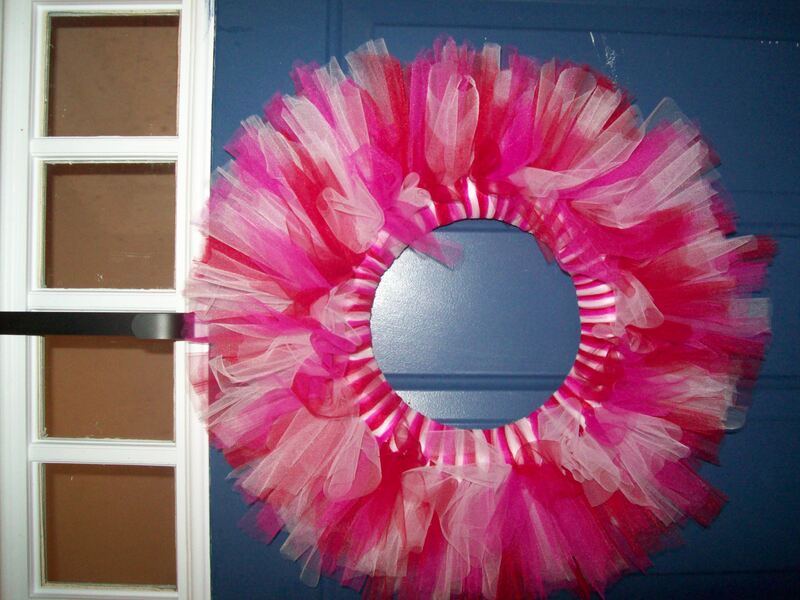 Keep adding your tulle until you wreath is full. This took me about 1 1/2 hours to do, so allow for plenty of time. Next, cut a 10 in piece of ribbon and tie the ends together with a double knot. Flip the wreath on its back. Separate a few of pieces and add a small amount of hot glue. Next, put the ribbon knot on the hot glue (careful not to burn any fingers). 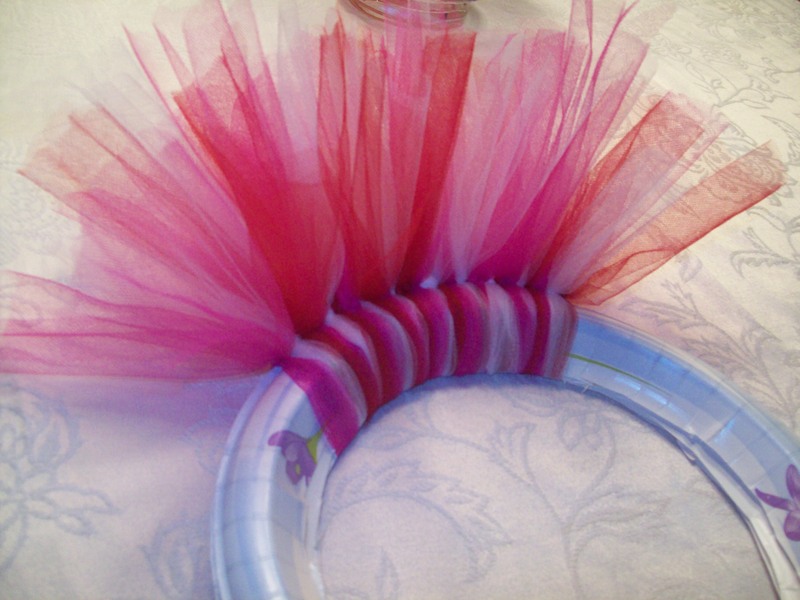 Let it dry slightly then push your tulle together. Your done! Now hang your wreath on your front door and enjoy! I hope you enjoyed getting your craft on. Remember, you don’t have to use these Valentine’s day colors. Any colors you use will look great! Let me know how your projects turned out. I would love to see your creations.